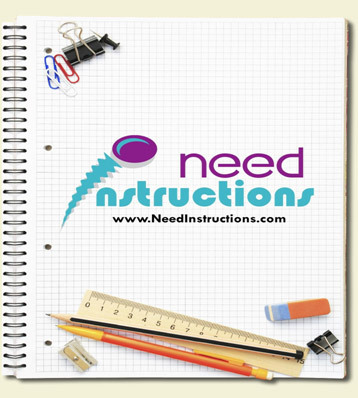 We have officially launched NeedInstructions.com and we are looking for great instructions by you! NeedInstructions.com is looking for step by step instructions on anything you can think of. NeedInstructions.com will be giving away great prizes. We're giving away an 30 Gig Microsoft Zune player; portable DVD player; USB Flash Drive; and NeedInstructions.com t-shirts. NeedInstructions.com is looking for you to "Create Your Own Instruction, Manual, or How To On NeedInstructions.com." You can also upload your own instructional video on NeedInstructions.com. Since NeedInstructions.com does not host videos, the video must be posted on another video hosting site first. The list of possible sites includes YouTube, Google Video, Blip.tv, and others. After it's hosted you will use the embed code to place it onto NeedInstructions.com, "Add a Embedded Video URL Instruction, Manual or How To On NeedInstructions.com." We are looking for instructions that are creative, well written, and well recorded. NeedInstructions.com will be judging your instruction entries by instruction content, step images, video quality, and the overall instruction. Our judges at NeedInstructions.com will be using a point system to determine the winner. Remember the more instructions you create, the more points you can earn. So what are you waiting for, go ahead and start creating those instructions! All instructions must have a create date of March 01, 2009 or higher to be counted for this contest! 2. Participants agree to abide by all decisions of NeedInstructions.com, contest co-sponsors, and judges, which shall be final and binding with respect to all issues relating to this contest. 3. Prize is not transferable and no cash alternative or prize substitution is available. NeedInstructions.com and contest co-sponsors reserve the right to substitute a similar prize of equal or greater value if the prize listed is unavailable for any reason. All potential winners are subject to verification at the discretion of NeedInstructions.com and contest co-sponsors. 4. Winner agrees that prizes are being provided "as is", and NeedInstructions.com and contest co-sponsors make no warranty, representation or guarantee regarding the prize, including but not limited to its quality, condition, merchantability or fitness for a particular purpose. 5. NeedInstructions.com and contest co-sponsors are not responsible for problems including (but not limited to) damaged, incorrect, inaccurate, lost, delayed, or defective entries, or for injury or damage to any computer resulting from participation in this contest. Entries that have been tampered with or altered are void. 6. NeedInstructions.com reserves to disqualify any participant or winner, at its sole discretion, deemed to have cheated, destroyed, obstructed, or otherwise acted illegally or in bad faith in relation to this contest. 7. NeedInstructions.com reserves the right, at its sole discretion, to disqualify any individual it finds, in its sole discretion, to be in violation of the Terms of Service; to be acting in violation of these Official Rules; to be acting in a unethical or disruptive manner, or with intent to annoy, abuse, threaten or harass any other person. 9. By submitting an entry and entering this contest, you hereby grant NeedInstructions.com sublicenseable, worldwide, royalty free right to publish and distribute your entry for their promotional purposes. 10. Governing Law: All issues and questions concerning the construction, validity, interpretation and enforceability of the official rules, or the rights of entrants, shall be governed by and construed in accordance with, the substance laws of the State of Nevada and any applicable laws and regulations of the United States.